Just a few days ago was the 24th anniversary of the first X-Files broadcast. I’ve been tinkering with starting my eight or ninth re-watch of the show and this seemed like a good enough motivation to do it. 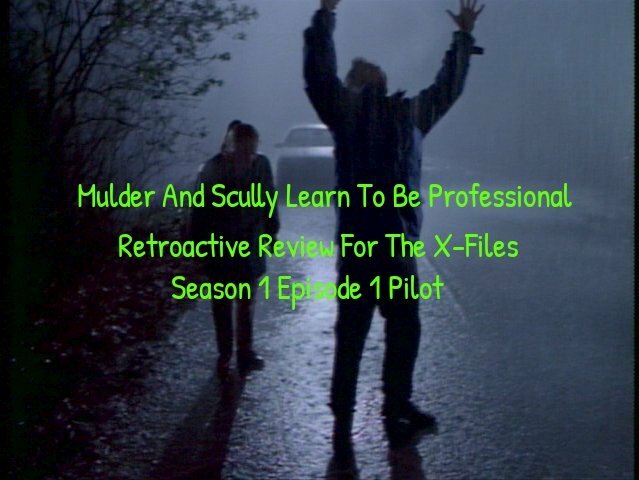 So without further delay, here is my rambling review/recap of The Pilot. Dana Scully, a young, poorly dressed female FBI agent/rational scientist has a meeting with some of her superiors, including a nicotine addict. Said superiors assign her to monitor/spy on Fox Mulder, an eccentric male FBI agent/psychopath who speaks in a bizarrely wooden and high pitched manner and inexplicably is named “Fox”. They are tasked with investigating a bunch of teenagers who appear to really love running into windstorms/light shows in the forest while sporting some wicked lower back mosquito bites. Also they enjoy dying. Mulder suspects/knows it was aliens while Scully has the more rational explanation of “something else happened”. After dealing with some standard issues like turbulence on a plane (which causes Agent Mulder a ridiculous amount of pleasure) and Scully being unable to recognize the sound of a truck, our intrepid agents find themselves driving down the highway when some aliens takes a picture of them with the flash on. Having been so disoriented that they both black out simultaneously for nine minutes, Mulder celebrates this moment by dancing around in the rain. Probably the least odd thing he does all episode. Scully notices some bug bites on her lower back. Deciding that she’s at a certain point in her life that she can’t take the two minutes to get dressed and that she so values the opinion of the lunatic who was just dancing around in the rain after almost having a catastrophic car accident, she heads over to Mulder’s hotel room half-naked. Mulder responds to this attractive woman stripping down for him after three days of knowing her by talking about his sister. With the world a safer place, Billy Miles undergoes hypnosis while Mulder, rather than paying any sort of attention, stares at himself in a one-way mirror. Scully, thinking this odd behavior, brushes it off as Mulder being an imbecile and goes to debrief with her superiors. She unknowingly hands them a piece of evidence that the nicotine addict then nefariously hides in the Pentagon. The Pilot is not the X-Files at its best but at least it shows that Chris Carter knew the general layout he wanted for his show. All of the elements are there that the show would fine-tune later; its just things are a bit creaky early on. We have a legitimately intriguing mystery which brings Mulder and Scully to “Ore-Gone” as Duchovny pronounces it. There is an air of menace and foreboding to everything and for the first 35 minutes or so, things are really looking good. But then, its like Chris Carter realized he didn’t have anyway of connecting the dots he wanted to and has Mulder come to an epiphany that doesn’t make sense. (Seriously…watch the scene of them at the graveyard in the rain again and tell me if you can actually track why Mulder thinks its Billy Miles.) Then we have the final set-piece but its like CC didn’t know what to do with it. So he just had the aliens…abandon their plans arbitrarily? Seriously, the last 10 minutes or so in Ore-Gone feel really rushed. Grievous plot-holes aside, the characterization is good even if not fully-formed. Scully is a little bit more exuberant than she is later (see her stripping down in a panic for Mulder) and Mulder is a bit more insane than he is later (see his o-face when the plane hits turbulence) but the essence of their characters is there from the beginning. Though in Mulder’s defense, Scully enjoyed the turbulence just as much. Mulder for his part is constantly testing Scully and seeing how she reacts to his bizarre theories and their banter is helped by the fact that David Duchony and Gillian Anderson have great chemistry from the start. Mulder opening up about his sister is well done and Scully shows her integrity in the way she handles her assignment to Mulder; her superiors may want her to just slam Mulder but she objectively recognizes that he is a great investigator. But damn some of the acting this episode is terrible. Thank god Duchovny stopped pitching his voice so high as soon as this episode ended. Gillian is way better but she’s not quite up to her future levels of excellence. Shout-out to the scene of her blatantly flubbing a line (right before she starts laughing in the rain). And the girl who plays Theresa is horrible. All in all, a good episode that lay a strong foundation. By itself, the case becomes confusing towards the end and not in a good way but the episode does a lot of good setup work. Plus the last shot of the Smoking Man is all sorts of awesome. Would CSM be this casual if he was missing his favorite TV show?